Ray Ryan is Senior Commissioning Editor of English and American Literature at Cambridge University Press, and the editor of Irish Essays. For more on the book, check out the Cambridge Book Club. A continual strain in his work is his engagement with Irish material. Donoghue’s lifelong engagement with figures such as Swift, Joyce and especially Yeats makes for compelling reading, even if you don’t know the material all that well. And you don’t need to read the book from cover to cover either. It’s the kind of book you can sit down with, by the fire with a glass of wine, dip into it, and just enjoy the evening. Donoghue is exceptionally good literary company. How does the book bridge its Irish subject matter with its audience here in the U.S.? Although it’s on Irish subject matter, the subjects Denis engages with are people with universal reputations. We’re talking about writers like Yeats, Swift, Joyce, Seamus Heaney, and in the contemporary period John McGahern and Colm Tóibín. Of course they are Irish, but they’re also writers for the world. If you grow up in America, a literary education would at some point involve contact with Joyce and Yeats. Brooklyn is one of the great novels of contemporary New York, and that’s from an Irishman: Colm Tóibín. The relationship between Ireland and America has very strong historical ties. Donoghue’s particular gift is to have a foot in the Irish camp, but to always speak to a global audience. He’s out to engage with the subjects in this book as an Irishman, but as a world-class intellect as well. What contemporary writers do you see carrying forward the tradition of Irish writing that Donoghue discusses in the book? Some contemporary writers Donoghue discusses in this book, actually. When you say contemporary, there are some elder writers here who span a lot of the twentieth century and are still vital figures today: Seamus Heaney is now in his seventies. Brian Friel is in his eighties. Then there are younger people like Colm Tóibín and Roddy Doyle, who are in their fifties, and there are younger people than that coming on the scene. Paul Muldoon, the professor of poetry at Princeton who won the Pulitzer Prize, is a good example of an Irish writer who has made himself into a major American talent, but with a distinctive Irish inflection. Whether they’re carrying on the tradition of Joyce and Yeats is a matter of continual critical conjecture. That’s what a lot of Irish writing is about: What’s the impact of Joyce and Yeats and Beckett—the great Irish modernists—on contemporary Irish writing? How does that impact relate to the impact of history more generally on Irish writers? There’s always an obsession among Irish writers with their precursors, and implicit in that is an obsession with history. History in Ireland usually means conflict, and often violent conflict. Because Irish writers were writing for most of the twentieth century, when people were killing one another over issues like cultural identity, the debates surrounding Irish writing had a particularly heated atmosphere. 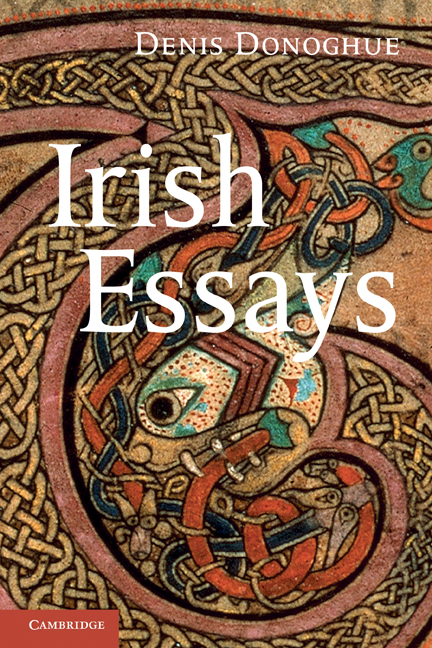 Catholicism, nationalism, unionism, Protestantism, the relationship with England, the impact of the famine … The expectation was that Irish writers would engage with those issues. If you didn’t, there was tremendous pressure on you to do so. If you did, you would then be criticized for giving expression to these atavistic identities. So, the “culture wars” in Ireland had a peculiarly intense focus, because they’re dealing with issues that people were willing to live and die for. The relationship between the aesthetic and violence has always been at the heart of the Irish literary imagination. This is one of the things that all Irish literary criticism contends with. What Irish writers inspired you growing up? You grow up with the greats of the Irish canon. You wouldn’t get taught Joyce when I was growing up, because he was thought of as a “dirty writer.” I grew up in a culture that was overwhelmingly Catholic and white. I never met a Protestant until I was about twelve or thirteen, growing up in Waterford. Nationalism was an engrained feature of the way you looked at the world. So the writing we were taught – I’m not saying it was propaganda, it certainly wasn’t that – but you would not get writers who were radically querying that kind of outlook. Yeats was the dominant figure. You would get taught Irish poetry. Short stories by Frank O’Connor. Joyce and Beckett weren’t favored, because they were seen as too radical. My own reading and immersion in this world came at a later stage, in my own personal reading. But the formal education was rather narrow, and didn’t take into account the full range of Irish writing. It’s completely different now. The Catholic Church has collapsed in Ireland; its authority is nothing like it was, most prominently because of the sexual scandals. It still has a power and a hold on people that it doesn’t have in other countries, but now it’s competing to be part of the public culture, rather than the public culture. And if you trace the career of somebody like Heaney, you see that trajectory: the shift away from indigenous topics, grounded in Ireland—with titles like “North” and “Door into the Dark”—to a kind of universal outlook, where his collections have titles such asSpirit Level. Heaney talks a lot about that gradual transition from being occasionally an ‘aggravated young Catholic male,’ when there was a pressure on him to be a spokesman for the Irish Catholic identity, to someone free to explore his own personal, unique poetic vocation. As a Northern Catholic now based in New York, Denis Donoghue is uniquely positioned, and uniquely gifted, to explore these kinds of strains.